I did Chest and Back today and now it hurts to type. And I didn't even do the actual DVD... I kind of made it up as I went along because David is visiting (YAY!) and I decided curling my hair this morning was more important than working out when I had access to a DVD player and a TV. So... makeshift Chest and Back. And it still destroyed me. And I beg to differ with Mr. Horton (despite the fact that I gave him the damn caption) - David assures me that I am looking good. 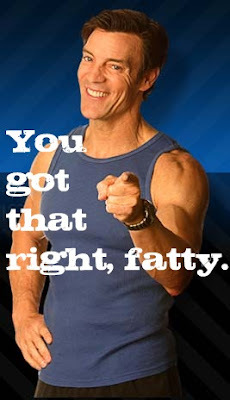 Apparently exercising and watching what I eat really does work. Damnit. 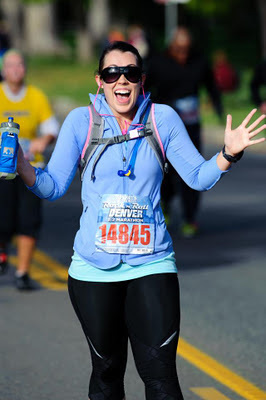 So since it hurts to type, I'll keep this short... ya'll should head over to Facebook and check out the pictures for the Rock 'n Roll Denver Marathon and 1/2 Marathon page. I'm in their album for the 2011 event! Looking just about as spastic and excited as usual. Not going to lie... damn proud to be on that Facebook page. Looking forward to my next Rock 'n Roll already! So exciting to be on the race facebook page!! I'm sore as heck from my first attempt at bodyrock.tv yesterday, it's nice to be sore! I think that good hair is really important sometimes! You are my hero for getting through a Bodyrock workout. I just stare at them and hate my life. I'm proud of you!